We offer advanced Cosmetic Dermatology and Medical Spa services for face and body in a welcoming, nurturing environment. Derby Derm delivers results for our clients through knowledge, technology and experience. Discover what our expertise can do for you through a comprehensive cosmetic consultation. Our clinical team will design a treatment plan to address your specific needs and wishes. This is a breakthrough treatment that will encourage the body to produce more collagen and elastin in problem areas, which generate new skin cells. It can improve a wide range of common skin complaints and lead to younger looking skin. It is the ultimate treatment for various skin conditions such as wrinkles, stretch marks, acne and surgical scarring, skin tightening, and hyperpigmentation. Collagen Induction Therapy, or Microneedling, is a deep, effective treatment that targets fine lines, wrinkles, acne scarring, hyperpigmentation, sun damage, and stretch marks with no down time. It works by micro injuring the skin and triggering a healing response, the body responds by rapidly creating collagen, thus correcting deep damage. This treatment is unique in that it treats damage without harsh chemicals making it safe for all skin types, ethnicities, and even pregnant women. Collagen Induction Therapy is effective for both correcting and preventing. Our skin’s cell turnover rate begins to rapidly slow down starting in our early to mid-20s. This means the signs of aging begin as early as 25! At this age damage is already being done even though we may not see it. This treatment will help to both reverse the signs of aging and prevent them all together. Book Your Collagen Induction Therapy treatment Today! We offer this as part of our Skin Rejuvenation Treatment. We start with Dermaplaning, a highly efficient, manual exfoliation procedure used to clear away dry, dead, superficial skin layers and surface debris and diminishes the appearance of the dry fine lines that are evident on aging skin. Completing this skin rejuvenation treatment is a botanical exfoliate blend of pumpkin enzymes combined with the calming influence of a seaweed mask. Dermaplane is also offered as an add on to any Chemical Exfoliation. You can choose to have the Dermaplane treatment on your Face, Neck, &/or Decollete. Book Your Skin Rejuvenation Treatment Now! 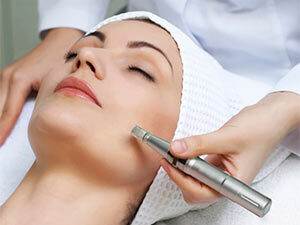 Microdermabrasion is a mild form of Skin Resurfacing. Skin Resurfacing can reduce the effects of aging on our skin. Years of sun exposure and the aging process take their toll on the skin, creating lines, wrinkles, and changes in texture and color. Not only is the face a likely victim of these changes, but the neck, chest, cleavage, arms and hands may be affected as well. Skin Resurfacing is a treatment that improves wrinkles, skin texture and color by removing the topmost layer of skin leaving it more supple and vibrant. Skin Resurfacing also stimulates the elastic tissue beneath the surface of the skin resulting in a healthier and firmer appearance. A wonderful alternative or compliment to chemical peels, the Diamondtome Skin Resurfacing treatment is non-invasive, pain-free and requires no down time after treatments. Results are gradual but highly effective. Most people experience softer, smoother skin after their first treatment. All Microdermabrasions are followed by a complimentary soothing, hydrating, moisturizing treatment. Book Your Microdermabrasion Treatment Now! A chemical peel/exfoliation is the next higher step in Skin Resurfacing. As we age, the accumulated effects of sun exposure, pollutants, acne, and scarring can damage our skin and cause us to look older than we are. Such skin damage can be treated with a chemical peel, a non-invasive procedure designed to promote cell growth and produce smoother, clearer skin. Chemical peels are also used to treat melasma (a skin condition characterized by irregularly shaped patches of brown skin commonly found on the face and neck). Chemical peels can be performed on the face, neck, chest, arms, hands, and legs. We offer a variety of advanced chemical peels that are ideal for skin tone and texture. 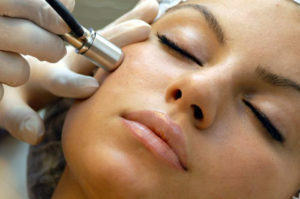 We suggest you try a Medical Microdermabrasion first and then follow with a series of Chemical peels. If you are new to the process, we will start you out with a light chemical peel and then progressively get more aggressive with each subsequent peel. The peels will be even more effective when paired with a series of Microdermabrasions. Book Your Chemical Exfoliation Now! We appreciate your personal endorsements and to show you how much, each time one of your referrals come in for an appointment you’ll receive a $20 Day Spa Gift Certificate. When one of your friends comes in for an appointment they will receive a discount offer too. For your safety and convenience all medical services are provided by Tim Weide, Licensed Physician Assistant to Dr. Jason Hampl. Please contact us today for an appointment at 316-788-3376. *We will be closed one Saturday each month. For your convenience you may now book or reschedule your appointment on line. Email: Derbyderm@aol.com Cancellation or rescheduing not accepted through e-mail.